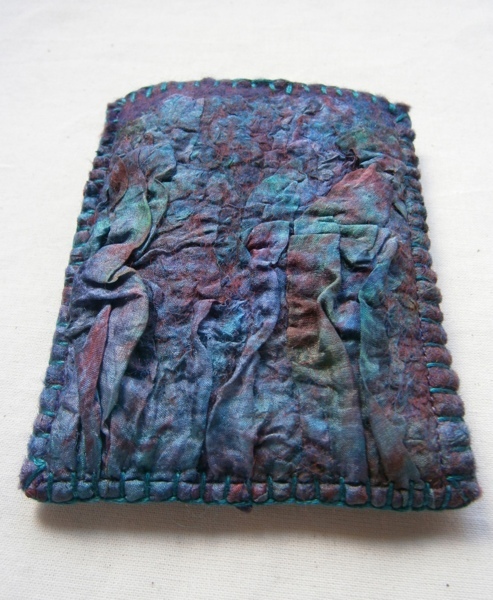 Today I am pleased to be reviewing the work of an inspirational fibre artist and to be adding a new category of review to my blog. 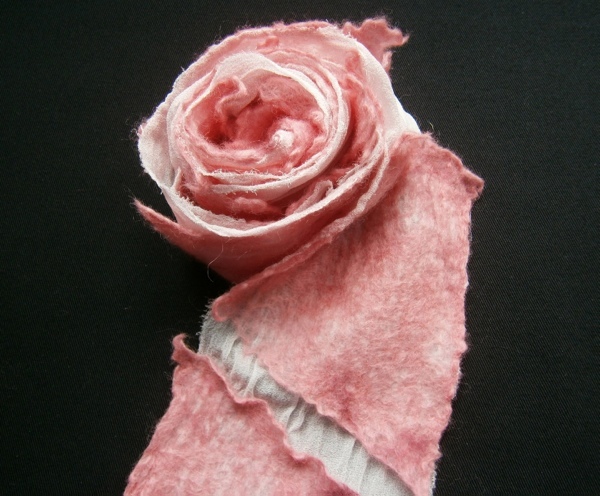 Zed produces pieces which seem to celebrate the true nature of the fibres she works with. It is as though she takes the most delicate fibres and works with her hands to create the form most perfect for that medium. Sometimes she adds some simple but well chosen stitchery and in each case the result is unique. The result might be the most desirable of hand worked purses, a phone case with some interesting effects, a notebook with an enchantment of harlequin colour, a simple piece of coloured decorative felt with some witty geometric stitching or a fabulous piece of nuno. Yes I admire her work. It comprehends colour, texture and form. 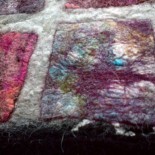 Nuno is the name used by textile artists for the techniques involved in wet felting fabrics into wool to achieve different effects. When I first looked at the book my reaction was one of immense excitement. Because? It gave me a sense of the complete understanding and control Zed has over the techniques of this art. 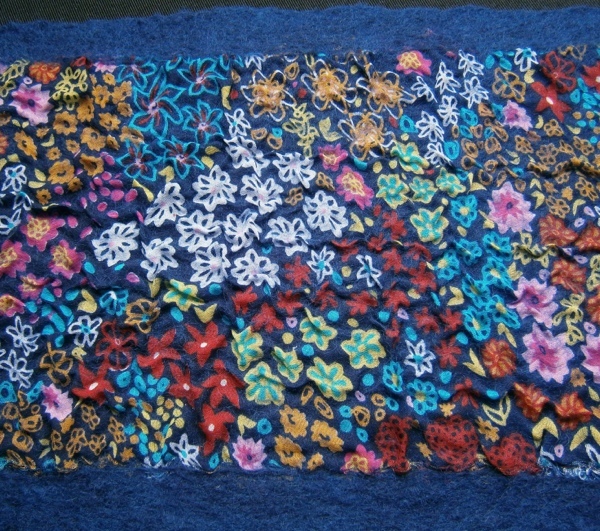 Personally, I am still at the stage of playing as a textile artist. As an adult learner without access to a textiles teacher this is a slow self-teach process, learning a bit about how fabrics and wool behave together through trial and error. But in the beautifully laid out photographs with clear text and diagrams that I found here, I could suddenly see the potential for achieving a sense of control over the medium and the effects I could produce. Zed introduces techniques and ideas I had not even dreamed of. I feel humbled by the knowledge in this book. In an easy access e-book format the book has chapter headings on the relevant major fabric groups (silk, organza, synthetics, open-weave cottons) allowing for easy use as a work guide. It begins with an instruction guide to the wet-felt process which is clear enough for a beginner to work from. The photographs are immaculately and consistently produced to show the central steps of the laying-out and end stage process needed to produce multiple different effects in each fabric grouping. The knowledge in this book has been achieved through an intimate and extensive relationship with fibre. This book could teach you to love, understand and work fibre. 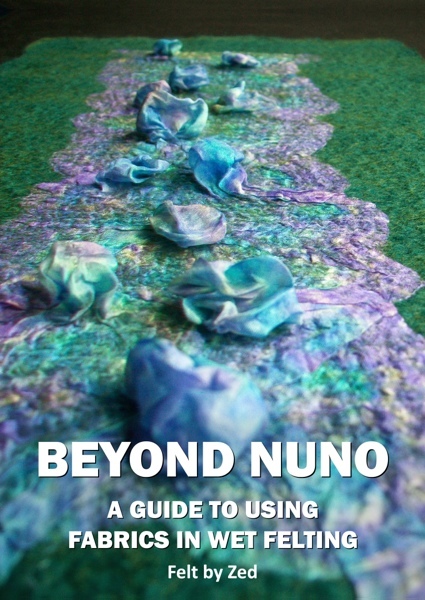 Whether you wish to learn the art of Nuno or simply to own the book for pleasure this is a book worth owning and much easier to actually work from than many of the other Nuno books on the market. The book is in itself an art work packed with the most beautiful, quality, textile photos. It evokes our desire to create. It is, indeed, a practitioner’s guide but, in addition, Zed has a sense for beauty in colour and simplicity and with every piece she shows us, she inspires. I personally hope there will soon be a print version.